There are some people who, before heading out of town for a week of vacationing in the sweet sweet sunshine, devote their free time before they hop on a plane to the fine art of organizing, packing, and prepping for said holiday. They leave no stone unturned, no loose end untied. Yours truly, friends, is not one of those people. No, no, I choose on a regular basis to save the packing for a frantic, all-night packing fest the night before I go out of town. True story. It's especially fun whilst trying to pack for an entire week. On the opposite coast of the country. But when shows like this come along, what's a gal to do? Packing seriously loses some luster when compared to the tantalizing triple threat of a show like Cloud Nothings and Eternal Summers and The Invisible Hand, oh my. And big love to DC9, it was really great to be at a show again there. Here's wishing them nothing but success from here on out. Charlottesvillains (ha) The Invisible Hand kicked things off with their politely brash, yet endearingly scuzzy little rock and roll ditties. Their Garcia-Marquez title puns added to their already instantly likeable collective stage persona. Love in The Time of Holler? Classic. The mix on the vocals seemed a bit muddy at times, but the onslaught of raging guitars and bevy of cheeky, over the top poses helped show the appeal of the band. In their lighthearted, party-band way I heard shades of some of those UK greats like The Undertones and The Stranglers. I dug their sweet, sassy rock, and was glad they had ventured up from Cville for the show. So despite the fact that it's only April, I've already managed to see Eternal Summers three times this year. You might say I kinda sorta like them. They were, as expected, a delight. As with the MACRoCk set, the band started kicking out the jams with the buoyant bubble of "Prisoner," a new song sure to become a favorite. The new fit seamlessly with the old, the pervasive surfs up, 60s fuzz bringing it all back home time and time again. Nicole's guitar had a nice shiver to it, and Daniel's drumming was nothing short of fierce. He bangs the drums, indeed. New Summer Sam added infinitely to the sound with his bass, really filling out the songs and giving the band an extra dimension of radness. Nicole's voice was really on, aggressive and challenging at times and sweet and plaintive at others. I have no doubt this here band will just continue to get better and better. And better. And just when I thought it couldn't possibly get better, lo and behold it did. I was super excited to finally see Cloud Nothings, the brainchild of rather youthful Ohioan Dylan Baldi. I instantly dug their live shimmy shimmy and feisty kick drum action. The frenzied pace of the instrumentation was tempered with an overall sweetness that to me was simply irresistible. It's so fine, there's no other way to go. They bounced around from sweetness and light to in your face aggression, and each incarnation of their sound was equally great. Despite Dylan's sore threat necessitating plenty of honey and a shorter set, the band sounded nothing but wonderful. In my humble opinion, this is a band that's at their best doing songs with adorable "ooh oohs," so cute are they and so gleefully do they tear through songs. They're heavy on the cute and heavy on the rock, y'all. 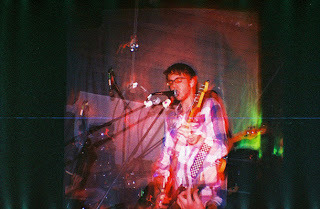 Frantic and furious, I ended up liking Cloud Nothings even more than I had imagined I might. The crowd was way into them, and I sure was too. Hell, this was the most fun one could hope to have on a Monday night. Packing just didn't stand a chance.